Abstract:The paper presents realizations in field of steel ladles linings durability increasing by respecting the drying-annealing diagrams imposed by the magnesia-spinel bricks and dolomite blocks manufacturers. The firing equipment, designed and completed for this purpose, assures the development of a higher thermal energy than the firing equipment used at the present, both by solutions for firing efficiency improvement, as well as by increasing the oxygen from the combustion air to over 30%, for increasing the flame temperature. The results obtained in the industrial conditions of ARCELOR MITTAL Galaţi are conclusive and confirm the viability of the adopted solutions. Keywords: thermal insulation, durability, oxygen, combustion installation. Abstract. The paper analyses the using possibility of the ferrous concentrates obtained from ashes from the termo-electrical station at the pig iron making in blast furnaces. These concentrates can be used to make pellets which are then used in the furnace charge. In the paper there are presented the pellet properties obtained from charges containing ferrous concentrates from termo-station ashes, in comparison with the pellets from Rusia and those from Romania. This comparison leads to the conclusion that pellets can be obtained corresponding qualitatively using such charges. Keywords: powder materials, technologies, valorification. Abstract. One of the most frequent problems facing metallurgists is the presence of Fe and his compound in secondary aluminum melting. This problem appears when using chip inadequate technologies. This work makes a survey on the problems which can appear because of the presence of Fe and his compound in aluminum. Two systems, Al-Si and Al-Si-Li, are analyzed, by taking into consideration metallographies, as well as the systems’ mechanical properties. The end presents metallographic evidence of the problems which Fe and his compound can cause in secondary aluminum meltings. Abstract: In this paper is presented an evaluation of the technological causes generating flaws at the railway monoblock (monoingot) wheel as well as of the up-to-date casting technology of ingots.There a new casting technology of ingots for the making of the monoblock wheels achieving which take into view the elimination of defects which appear at the level of casting as well as at the level of solidification at solidification. Abstract: The paper presents a series of technological observations regarding the estimation of surface temperature for the continuously cast semi-product, starting with the crystallizer and up to the cutting aggregate area. The obtained data have been processed in EXCEL to obtain linear and nonlinear dependence relations. To determine more accurately the interdependence of technological parameters, the data have been processed in the MATLAB program obtaining the correlation both in graphical and analytical form. Keywords: continuous casting, mold, flux powder, flow, water cooling. Abstract. The present work reports the synthesis of three kinds of nanoparticles: AgNP, AuNP and Au–AgNP. The obtained NPs are characterized by energy-dispersive X-ray fluorescence (EDXRF) transmission electronic microscopy (TEM) and UV–Vis absorption spectroscopy, so as to evaluate their qualities. The developed NPs seem to be with interest for future sensing and biosensing applications including DNA sensors and immunosensors. Abstract. The present paper establish a relationship between the thermal analysis TGA, DTG, elemental analysis EA, and EDXRF spectroscopy, all of them being applied for evaluation of thermal stability of the paper samples, its components and nature of fillers as nanomaterials, too. Also, these techniques help us to determine the history of the paper samples, the method of manufacturing of the historical papers. Prospective, this analytical tackling create the premises to elaborate some properly methods for paper documents preservation taking account to ageing and degradation processes of the historical paper. The characterization of historical papers was performed by thermal analysis (TG-DTG), and its first derivate (DTG) with energy dispersion X-ray fluorescence results (EDXRF), elemental analysis (EA), infrared spectroscopy (FTIR). The samples were taken from some historical paper samples, unprinted and unwritten (from private collections), prelevated from books of the end of the XIXth century and of the beginning of the XXth century. EDXRT and FTIR spectropic methods can be used to identify various components of fillers and TGA, DTG analysis to observe the reactions associated with the controlled heating at 25–1000°C in dynamic air..
Abstract. Occurrence of surface defects on steel products may have very different causes, in view of their long-flow route, each step may be a potential cause of such defects. .The present paper contains a complex analysis of 76 mm thick A-36 steel plates that had surface defects in different areas of them. Following tests carried out to reveal the main causes of defects analyzed has been pointed out that the deficiencies in the slabs continuous casting process of which were rolled the plates, namely the entrapment of slag in some areas of slabs surface accompanied by crystallizer erosion which took the effect of formation of copper microinclusions in areas with surface defects. Abstract. The present work reports a simple route to prepare tin monosulfide semiconductor nanocrystals at ambient conditions. The solution changed from colorless into brown immediately and phase-pure SnS, which was confirmed by powder X-ray diffraction (XRD) was produced. The transmission electron microscopic (TEM) investigation shows very thin rectangular flake like SnS crystals of 10 ∼ 20 nm in size. Abstract. The photodynamic therapy (PDT) of tumors takes advantage of the ability of some photosensitizers (porphyrins, phthalocyanines) to be accumulated in significant amounts and to be retained for prolonged periods of time by tumor tissues. The photophysical properties of the porphyrins used in PDT drastically change upon aggregation. Anionic porphyrins such as sulphonated meso-tetraphenyl porphyrins, TSPP, have been shown to accumulate preferentially either in the cytoplasmatic membranes or in the lysosomes. The aggregation process of some sensitizers for PDT such as tetrakis(4-sulphonatophenyl) porphyrin (TSPP) are investigated by different spectral techniques: absorption, fluorescence, steady state and transient absorption spectroscopy. The excited states lifetimes and the aggregation process for TSPP is discussed in this paper. Abstract. Applications of nanomaterials as carbon and porphyrin nanotubes and fullerenes for treatment of cerebral aneurism and brain human tumors are discussed in this paper. Keywords: nanotechnology, nanoparticles, cerebral aneurism, carbon nanotubes, fullerenes. Abstract. A wide availability of modern analytical instrumentation and methods for thorough quantitative and qualitative analysis of various materials are increasingly employed in recent decades in archaeometry. In fact, physico-chemical characterization of archaeological objects has essentially contributed to the progress in studies of culture heritage. Knowledge of detailed chemical composition of materials used in the past may significantly affect methods of restoration and conservation. Information about possible routes of chemical degradation of various materials is often helpful when identifying materials employed in the past, and also may result in the development of effective methods to preserve particular objects to be protected from further deterioration. Among the materials composing the art object, organic compounds used as binding media or protective coatings have attracted the attention of the conservation profession given their noticeable ability for undergoing morphological and chemical changes on ageing. Thus, the aim of this paper is to review the most recent advances in the identification and determination of organic compounds present in art and art conservation materials. Spectroscopic techniques, such as UV-vis, FTIR and thermal analysis, have been coupled with light microscopes for these purposes. Mass spectrometry has also been increasingly used as a detector system coupled with a chromatographic device. Chromatographic methods have also improved in recent years. Paper and thin layer chromatographic techniques have been progressively replaced with gas chromatography (GC). Finally, a number of new instrumental techniques have been proposed as a suitable alternative to the conventional microscopy techniques for morphological studies. Abstract. The paper present the result for reaserch of processing, characterization and behaviour of composite materials with silicon matrix used for absorbing the electromagnetical wave energy. It was made six types of materials with difrent composition added on the two substratums – carbonic wed and metallic wed - with purpose the evaluating of the efficiency for the absorbing of the electromagnetical wave energy using the medium and high frequency. The measurement was made in the range of 100 MHz -6GHz. The materials was made in laboratory and contain two substratum: carbonic wed and metallic wed impregnated with mixture of and the silicon rubber composites with the addition of grafite and iron-silicon. The measurements was made on the materials sample and marked out an absorbtion of the electromagnetical wave energy of 40-70dB for all the types , the conclusion : the materials can be used in the range of 100MHz -6GHz for practical applications. Abstract. The most well known practical application of crystalline microstructured components is found in MicroElectroMechanical Systems. The fields of MEMS are truly interdisciplinary. An understanding of mechanics, fluid dynamics, electromagnetism, circuit design, materials science, and numerous other subjects is required. Mastery of many of these subjects requires a firm grounding in mathematical methods. Mechanical properties are of critical importance to any material that is used for transmission of forces or moments, or just for sustaining loads. The gradual introduction of microcomponents in practical applications within microstructure technology (MST) has instigated an increasing demand for insight into the fundamental factors that determine the mechanical integrity of such elements, for instance, their long-term reliability or how to choose proper safety limits in design and use. Abstract. In this article, we are interested, specifically, in the topic of MEMS based sensors as devices rather than either smart materials or smart structures. A "smart sensor" is a transducer (or actuator) that provides functions beyond what is necessary to generate a correct representation of a sensed or controlled quantity (e.g., temperature, pressure, strain, flow, pH, etc.). This type of functionality will typically simplify the integration of the transducer into applications in a networked environment. 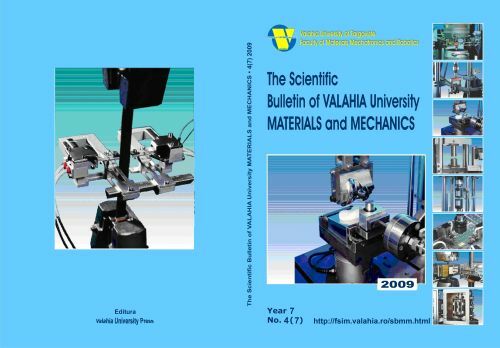 1Valahia University of Targoviste E-mail: poinescua@yahoo.com 2ICECHIM, Bucharest. Abstract. Corrosion inhibitors based on dye heterocyclic compounds with nitrogen, sulfur and / or oxygen usually react by adsorption on a metal surface area providing protection. It is very well known various dyes as methylene blue, xanthene type as eosin, antraquinone type or azo dyes, as methyl red or methyl orange dyes and cianine type as eritrozine). This paper will present a comparative study of the inhibitory action of some dyes: eosin, erythrosine, methylene blue on two types of steel: OLC45 and 316L. Effect of the corrosion inhibitor will be studied in the presence of ZnSO4, and the synergy action responsible for the protective layer on the surface of these two steel types, will be analyzed by specific spectral techniques. Abstract. Investigations of some porphyrins from thermal and photochemical point of view provides significant informations relevant to enzymatic and cell membrane interactions, organic and inorganic reaction mechanisms. Thermal stability of haemin chloride (ClH) has been investigated for this paper in order to evaluate the nature of thermal behaviour of this compound. For photochemical stability, Triton X-100 has been widely used as a non -ionic surfactant for solubilizing this porphyrin. The present paper is deals with the absorption UV-Vis variation spectra of some porphyrins from haemin chloride at critical micellar concentration (2.7 x 10-4 M). The effect of pH and concentration on the photostability of haemin cloride reaction, has been examined in this paper. The increased photostability in micellar medium can be attributed to deep penetration of the porphyrin into the micelles with the polar group OH oriented towarded to the micelle surface. Keywords: micellar, photodegradation reaction, porphyrins. Abstract. The production of composites in the liquid state is based on the activation of surface phenomena directly on the reinforcement surface. The fabrication of cast aluminum alloy-graphite particle composites and hybrid aluminum composites, by stirring graphite particles and graphite + Al2O3 or graphite + TiC particles in molten aluminum alloys (above their liquids temperatures), followed by casting in permanent moulds, are described. Addition of magnesium either as pieces along with ceramic particles on the surface of the melts or as a previously added alloying element was found to be necessary to disperse of graphite particles in the melts and retain them as uniform dispersions in castings under the conditions of present investigation. The obtained aluminum-graphite composite and hybrid aluminum composites are investigated by micro structural and mechanical point of view. Abstract. The dry sliding wear behavior of cast Al-based composites reinforced with ceramic particles (Graphite, Al2O3 and Graphite + Al2O3) in different proportion was studied. The prepared composite aluminium matrix contains (1-3) vol. % Graphite particles (1-5) vol.%Al2O3 and hybrid composites with 5 vol.% Al2O3 + 1 vol. % Graphite. The composite alloy was prepared by vortex method. As matrix we used three types of aluminium matrix: Al99.5, AlSi12CuMgNi and AlZn6MgCu. To attain the peak hardness values of the alloys, age hardening behavior of the monolithic alloy and also the composite alloy was investigated. The wear tests were performed at room temperature using a pin on disc friction-wear machine at contact pressure (applied load) of 3.5 and 7.5 x 10-1 MPa, at sleeding speed of 3.8 m/s. The results showed that the addition of Al2O3 particles increases the hardness of the Al alloys and at the same time accelerates the aging kinetics, and addition of the Graphite particles decrease the hardnes of them. The composite material sample was tested under dry friction conditions to determine its friction coefficient and the wear. The sliding wear properties of Al alloys were significantly improved by the addition of Al2O3, Graphite and Al2O3 + Graphite particles. Abstract. Magnetic fluids mainly consist of nano sized iron oxide particles (Fe3O4) that are suspended in carrier liquid. In recent years, substantial progress has been made in developing technologies in the field of magnetic nanoparticles. The synthesis of magnetic nanoparticles at low temperature with dimension under 20nm can be obtain by one of the tree synthesis methods: electrochemical synthesis, sonochemical synthesis and cryosynthesis. Some investigation techniques as: X-ray diffraction (XRD), transmission electron microscopy (TEM), atomic force microscopy (AFM), vibrating sample magnetometer (VSM) and UV-Vis absorbance spectroscopy, have been used. Keywords: magnetite, sonochemical, electrochemical, cryosynthesis. Abstract. In time, in order to develop new materials, research physical, chemical and engineering research have led to the development of new methods of analyzing the structure of correlations between structure and properties of the material. Characterization of material properties of a composite material (mechanical, physical, chemical, structural) is not reduced to the study of properties taken independently, studying interdependences between material components and their determinations involving investigations relatively complex, both in analysis phase but especially during the testing of them. The polypropylene improved with Reogard 2000 ® is a composite material and the focus of this paper are to determine the values of mechanical properties and the influence of the percentage of the Reogard 2000® in polypropylene. Abstract. The paper follows of how to design a mechatronic system entitled linear positioner, whose final movement can be viewed and recorded electronically. The authors made a detailed study on the technical performance of positioning, depending on electrical parameters of command, dictate the software under a given hardware system. In terms of correlation with technical actuality, the work introduces the technical features of type PWM, SMD, micro, electric micromachines, digital microscopy, compiler, image acquisition, high level programming language. Abstract. This paper is based on the project “PRODUCTION ALIGNMENT OF EQUIPMENT AND TECHNOLOGY FOR MICRO/NANOPROCESSING AT EUROPEAN AND WORLDWIDE REQUIREMENTS AND DEVELOPMENT TENDENCIES”. It is an analysis and evaluation of actual nationally and internationally situation of micro/nanotechnology domain. The main objective refers at national economical increase and at preparation of integration in European research space. This presentation highlights nanotechnology as an important direction for the development of science worldwide, taking into account its application domains (medicine, biology, electronics, nuclear physics, etc). Innovation at materials, systems and nanotechniques levels opens new opportunities for the development of improved nanosystems and nanomaterials. Their usage in different industrial applications require a prior processing to obtain improved results, and of course different techniques and equipments. This is the main reason why in United States, Japan and European Union, nanotechnology became a priority around the year 2000. The expenses have been combined from public and private sources, in order to realize all the necessary experiments and finally, products. Presentation of involving entities from Romania in the micro/nanotehnologic domain highlights the evolution made by the scientific community in the country in the direction of alignment with European standards, particularly that of research with opportunities for the expansion of applications. After studying the national situation, the main conclusion is that there is a big lag regarding the stage of research in our country. This is the consequence of difficulties regarding organization, infrastructure and human resources. Abstract: Industrial production need to increase Bar and Wire peeling productivity, as well as products’ quality, require a scientific approach of the specific technological aspects. This work deals with the issues of improving the cutting operation’s technological parameters, in order to ensure an increased productivity. Abstract. Regarding the industrial production necessity of improving the drawing process, and the importance of the products, the work demonstrates technical limits and possibilities that lead to refining one of the product qualitative parameters, exactly the dimensional precision. Abstract. The functional and design capabilities of a metallic implant are important with respect to the metal's ability to be formed, machined, and polished. An implant metal must be capable of being utilized with state-of-the-art metallurgical techniques. In addition, the implant device must remain functional during its expected performance life; it must not be degraded with time in the body through fatigue, fretting, corrosion, or impact loading. Titanium and its alloys meet all of these requirements. The principles of design, selection of biomaterials and manufacturing criteria for orthopedics implants are, basically, the same as for any other product that must be dinamically stressed. However, even the replacement of human tissues with materials similar in shape and density seems tempting, in fact this is much difficult task to undertake. That is because the living tissue has some extraordinary caracteristics including the capacity of remodeling both micro structural and macrostructural under the different directions loads. Abstract: Improvement of monitoring techniques is essential to make the complex grinding and dressing process more reliable, economical and user friendly. Remarkable progress in the field of shareholders, electronics and sensors allow very precise measurements of very large acquisition frequency, which allows control of each phase of the process itself. Measurement in real time requires a very useful ''feedback'' to this new generation of monitoring and control equipments. Abstract. This paper presents a new type of automatic plant for drying and heating of circular distributors characterized by utilization of two gas burners with impulse, of a radiation economizer, of an equipment for the process automatic control and a lifting device, which assures a minimum specific consumption of natural gases, the heating temperature increment till to 1500°C, the heating uniformity and also, low pollutant emissions, at the best working conditions. Keywords: drying, heating, circular distributor. Abstract: The work discusses both at the national and the international level, the scientific and technologic evolution from precision mechanics engineering to intelligent and information micro-engineering, by presenting engineering evolution matrixes, the structural and the functional generations of High-Tech integrated products, technologies and concepts that make use of advanced research areas and of the development in competitive knowledge. The scientific work uses examples taken from different evolution phases and highlights the news occurred in the field at certain moments and the attained technical and scientific level of performance, trying also to predict the evolution of future engineering and micro-engineering. Abstract. In this paper will be presented a new technology, using new materials especially designed for complex geometries, extensively used in research-development and innovation area. Even highly complex geometries are created directly from 3D CAD data, fully automatically, in just a few hours and without any tooling. It is a net-shape process, producing parts with high accuracy and detail resolution, good surface quality and excellent mechanical properties. Abstract. The paper tackles the state of stresses developed in the accordion firebox of a boiler of hot water, in order to establish the possible residual time of service. We take into discussing the minimum thickness of the lenses and forecast a further attenuation of the wall. The calculation is done for normal working conditions (pressure and temperature), and pressure of hydraulic test, too. Abstract: The paper, taking into account the tensions developed in a section of pipe, for minimum measured thickness after 18 years of functioning and 17 years of preservation, under the workload pressure and probation pressure, proposes an ulterior working period of 12 years (of functionality). The value for the residual life cycle is calculated based on the thinning criteria for the wall of the pipe, with an average corrosion speed after the 35 years of use, and assuring the stress conditions. Abstract. The article makes an analysis of states of stress in some constructive elements of a heat exchanger from a petrochemical technological line, operating as an overheater, in order to assess the duration of residual life. In this respect there are taken into question the results of measurements made and the normal functioning and conservation period. Abstract. Different modeling and construction aspects for a double hexapodal robot are presented in this article. The robotic structure consisting of two staged hexapodal platforms combines in a certain measure the advantages of the robots with parallel kinematics and of the serial robots: high accuracy, high stiffness, fast response and small dimensions. The extension of the operating space is the main aim of this particular structure. Abstract. The dynamic stresses occur along with impact, inertial loads and they are added to the service stresses leading to values greater than the maximum allowable limit. Thus, in order to take into account their effect, an overloading factor must be considered. In the case of dynamic system such as shafts, the start under loading implies torsional vibrations that have as immediate effect important dynamic stresses. This article presents the computational method involving these stresses and it shows also the influence of mass, stiffness and active/reactive torque parameters on the dynamic stresses variation. .
Keywords: dynamic stresses, torsional vibrations, constant torque. Abstract. The ending of 80’s marked a period of research in development of a new way of information processing approach in calculation systems. This kind of approaching was named, or connectionism and parallel processing, or neuronal networks. The last one has removed the classic way of algorithms and we can say that neural networks stimulate thoughts proceedings of the brain, based on experience. Keywords: neural processing, feedback networks, Gauss distribution, hidden layers, Delta rule, learning laws, feed-back, feed-forward networks. Abstract. By this paper, it has been tried originally and properly, to perform a technical principle very often used in automotive electronics, namely the digitizing mechanical commands generated during the driving process by an automobile driver. Abstract: The connections located on the surface of some vessels, serving the industrial installations are close configurations to cylindrical (as frequently), conical shapes, etc. The design, the execution and the assembling of there require both the drawing of the unfolding of the coupling and the dwelling of the vessel casing. The paper solves graphical one of these applications using the classical method of the descriptive geometry and modern mathematical means, using Mathematica 5.1 program.